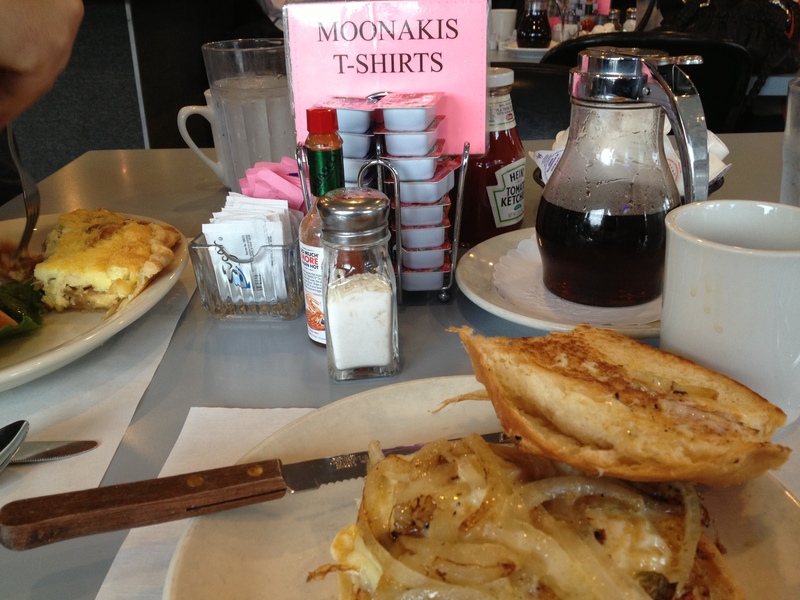 I’ve never had anything I didn’t like at Moonakis Cafe. Omelettes are fluffy, not greasy. Pancakes are slender but still meaty. Potatoes and grilled English muffins round out your main dish nicely. But this weekend I had a Portuguese breakfast sandwich that knocked everything else out of contention. Chorizo, cheese, onions, and an egg on a sweet roll. I’d never had one before, and the combination sounded interesting but not necessarily exciting – but now I’d like to recreate this at home. It’s a good size sandwich but not overstuffed, you could have it for breakfast or lunch without feeling like you need a nap afterward. The chorizo and the sweet roll play well off of each other, and Moonakis grills the sweet onions just enough to have a little snap against the melty cheese. Until they put the lemon poppyseed pancakes back on the summer menu, I’ll be eating this as often as I can.